Play Moxie 2 online for free! I'm Christopher York, co-inventor of Moxie, and I'd like to tell you a little bit about our game. First of all, it's a word game that's DIFFERENT from anything else you'll find on the iPhone App Store, and that's by design. We were tired of seeing the same word game themes recycled over and over again...anagrams, Boggle, word finds, and stuff like that. We wanted to make something truly unique, and I think we've succeeded. NO PRESSURE. Moxie is not a race. There's no clock. You can go as fast or as slow as you like. QUICK TO PLAY. The average game of Moxie takes less than 5 minutes. QUICK TO LEARN. Moxie only has a few simple rules, and we've even included a short video to show you how to play. ERGONOMIC. Are you tired of tiny little hard-to-press buttons and screens you can hardly read? The Moxie board is simple, clear, and direct...and you can actually see the buttons without your bifocals. REWARDS STRATEGIC THINKING. You don't need a vocabulary the size Webster's dictionary to score well. Sure, it helps to know a lot of words, but good old-fashioned strategy will get you a lot farther. WHOLESOME. That's right Moxie is just good clean fun. There's no crashing into anything and no killing anything. Why even your Mom will enjoy playing Moxie. I know mine does. In fact she helped invent the game! 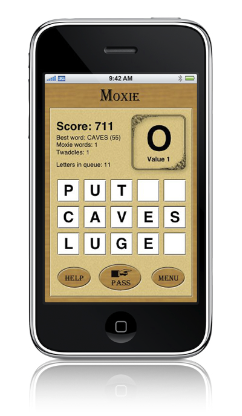 Moxie is the word game guaranteed to please. Play one game and you'll be hooked. If you're good maybe you'll even get the high score, but I doubt it. My Mom has scored 3310 and honestly I don't think you'll be able to beat her. I sure can't! You start with a hand of 52 letters that you go through "Solitaire" style. Place each letter on the board or "Pass". If you "Pass" you can't go back to that letter. Transforming your words into other words by adding and replacing letters. For example: "TIN" becomes "TINE" which becomes "TILE" which becomes "TILED" and so on.